This is a typical work-day outfit for me. 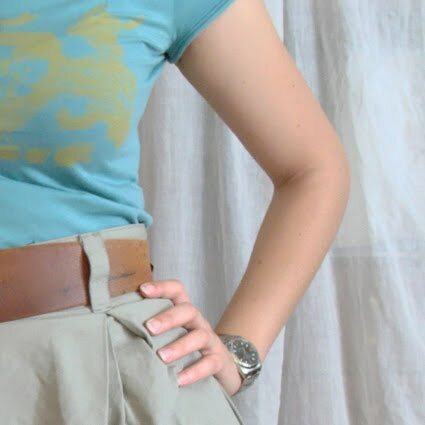 Simple as a t-shirt, a skirt, flats and some tan-coloured accessories like my tote, bangle and belt. I hate being matchy-matchy with my shoes and bag! I've had this t-shirt since before I was 20, me thinks. I love the flattering neckline, its colour (teal is one of my favourite hues) and that abstract yellowish print in the front that reminds me of a Rorschach test. However, fitting trends were apparently different back then and it now appears way too short on the torso for me to wear it with normal rise skirts or pants. Baring your midriff is acceptable when in your late teens, yet not the best option for a working 26-year-old. But, tuck it into one of my beloved high-waist skirts and problem solved! Teal t-shirt, DIESEL (about seven years old). Khaki tulip skirt, H&M. Grey patent peep-toe flats, H&M. Tan bag, Mango. Leather belt, mum's vintage. Wooden bangle, Alexi Andriotti (a freebie from Stylewatch's Fashion Playground event). great skirt - you look super cute! Whenever I see a tulip skirt, I think of you, Lopi! By the way, I'm having a best dressed reader contest on my blog and would love for you to enter! Click here for details! that is how i wear my tee's from the teens! lovely and functional outfit dear! Super φουστίτσα! ναι το ομολογώ και εμένα μου την δίνει το ταίριασμα τσάντας παπουτσιού! γενικά πλέον έχω σταματήσει να ταιράζω τα ρούχα μου. Θέλω κέφι, να παίζει το μάτι να έχουμε αλλαγές σε χρώματα και μοτίβα! Χωρίς υπερβολές γιατί μας βλέπω χωρίς δουλειά ! καλό σκ!!! what a great skirt! i love the teal-brown-gray combination! m aresei polu i foustaa sou..
i love that kind of skirts! teleios sunduasmos!ti oraia idea eidika otan eisai se grafeio alla kai mikris ilikias stekesai mia xara etsi mpravo!